Are you looking for a quick and efficient way to draw your concealed carry firearm? Do you want the ability to protect you and your loved ones at a moment’s notice? High Noon Holsters has all of your holster and accessory needs! Our Pocket Holsters are perfect for people who want rapid access to protection. They are custom-made from high-quality leather, allowing your weapon to be drawn and re-holstered quietly. Our unique design keeps the Pocket Holsters in place throughout the entire withdrawal process. 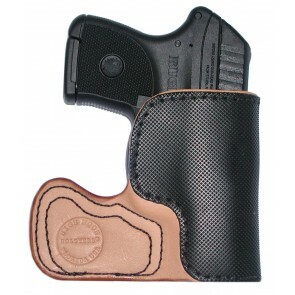 The leather holsters also add the benefit of comfort by keeping all sharp edges from digging into your body! 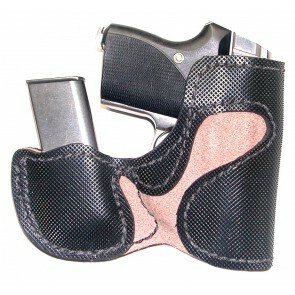 The Pocket Holsters are designed for true gun enthusiasts. They feature an open muzzle design and are molded to the gun you own. The special materials are highly durable, and effectively hide the outline of your weapon, giving you the upper hand to unsuspecting threats. Some of our gun holsters are designed for larger guns that aren't traditionally carried in your pocket. With these weapons, the holster becomes enough for backpack carry, glove compartments, or even pocketbooks! In addition to excellent performance, High Noon Holsters Pocket Holsters also add a distinctive style to your daily attire. The luxurious leather finish screams class while paying homage to the gritty gunslinger look passed down for generations! The holsters come in cowhide or optional horsehide. Provide protection for you and your loved ones by always carrying your weapon on you. Our gun holsters supply you with everything you need for the first draw! Pocket Grabber: The Pocket Grabber features specially designed extruded material that "grabs" the inside of the pocket. When you draw your handgun, it comes out easily while the holster stays in place. The holster releases the gun from the bottom with a quick thumb push, providing greater control and enhanced safety when drawing. Pocket Reload: As with the Pocket Grabber, we've designed the Pocket Reload to stay firmly in place when brandishing your weapon. Because we've stitched the material to the outside of the pocket, it's more difficult for others to see the outline of your handgun's shape while it's inside the holster. There's also room for an additional magazine, which can be advantageous if you find yourself in a heavy-fire situation. Both of these custom pocket holsters are available in your choice of beautiful and durable horsehide or cowhide leather. We can also produce them to fit models from top sidearm manufacturers such as Beretta, North American Arms and Seecamp. Here at High Noon Holsters, we've been making quality our top priority for more than 20 years. We handcraft every holster with pride in the USA. We strive each day to achieve our goal of 100% customer satisfaction. If you're not happy with your holster for any reason, please let us know and we'll do our best to correct the issue. We've made our e-commerce site simple to navigate, saving you time and hassles. You can build your product wish list quickly and check out securely using your preferred payment method. Both of our custom pocket holders are stock items, which means we can ship them in as little as 1-5 days. Order Your Custom Pocket Holder Today! Please browse our custom pocket holder models and choose the one that best meets your requirements. If you have questions or need assistance, feel free to contact our friendly customer service team by email or telephone.